no one keeps it short, sweet, and awesome quite like Anna! If I followed the conventions of "Lisa Is Busy Nerding," my blog would have to be called "Anna Is Busy Swooning." I'm a sucker for romance and proud of it. 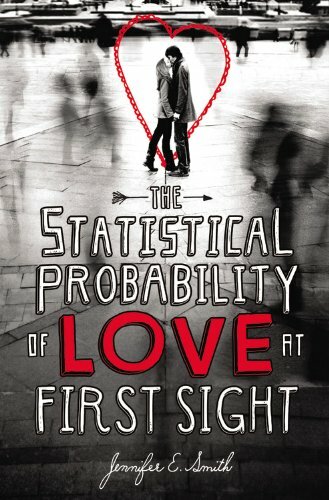 So, clearly, if I'm naming my favorite book of the year, I'm going to have to name the book I read that threw me into an absolute, sinking-down-onto-the-chaise-with-hand-over-forehead/bring-me-the-smelling-salts romantic fit: "The Statistical Probability of Love at First Sight" by Jennifer E. Smith. Oh, I know, I'm a total tease because THIS BOOK ISN'T EVEN OUT YET. But, it was my favorite, so you better get pumped and start your preordering for Jan. 2. So here's the deal: Hadley is flying to England, reluctantly, to attend her father's wedding. She misses her flight but happens to meet a charming young British man named Oliver at the airport gate while she waits for the next flight. Sure, I know what you're thinking: "Um, who talks to strangers at airports? This sounds like my worst nightmare!" Well, then clearly you skipped over the part where I said "CHARMING YOUNG BRITISH MAN." Hellooooo. Okay, now you're with me, right? It is perfect romantic story that needs to be made into a movie instantly. Buy it. Enjoy it. Let me know what you think! Oh how I adored this book. Can't wait to buy my finished copy REAL SOON! GAH I need to get this book stat!!!! I can't wait for this one! I totally forgot the release is coming so soon! I need to go pre-order this now! And I'm a brand new follower! Love your blog!